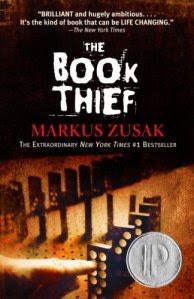 For YA (young adult) fiction, Mark Zusak’s novel The Book Thief holds it’s own on any adult’s bookshelf. Narrated by the omniscient character of Death, this novel set in a Nazi German village does well what other books have fallen short of (Chris Bohjalian’s Skeleton’s at the Feast, to name one) – portray what it might have been like to be German during World War II. Death tells the story of a young girl from age 10 to 14, adopted by a German couple; the reason her mother gives her up is unclear, though at one point I was left wondering if she may have had some Jewish blood. Nonetheless, the story opens with Liesel on the train with her mother and brother; Death comes for her brother. Liesel is the book thief, and the first book she steals is after her brother’s burial – a quick but necessary task that interrupts their journey. Later, she steals a book that is meant to be burned during a celebration for the Fuhrer’s birthday. Finally, she develops a friendship of sorts with the Mayor’s wife who provides opportunities for Liesel to ‘steal’ books from her library. The importance of books in this story underscores Liesel’s recognition of the power of words and language. Among the memorable characters of The Book Thief are Hans and Rosa Hubermann, Liesel’s foster parents. Hans is a kind soul who comforts Liesel from her nightmares and teachers her to read. He’s also a Jewish sympathizer, and hides a Jewish refugee, Max, whose own father saved Han’s life during WWI. Rosa is a hard, cursing woman whose softer side emerges during Max’s stay. Rudy Steiner is Liesel’s best friend, the boy next door, and her comrade in stealing both books and food. Through these characters and others, the reader gets a look at what life is like for Germans during the war when sons and fathers are being sent off and returning (or not) from combat; the Nazi party is an exclusive membership by which businesses and their owners live or die; and neighbors learn that sirens are the great equalizer capable of leveling age, gender, status and even long-standing feuds. All the while Jews, in The Book Thief, are not so much hated as they are feared for the attention they may bring to a village, a street, a home or an individual. And then there is Death. The single most overwhelming success of this novel is it’s narrator. Remarkably objective, Death collects all souls with care, despite the concession of how laborious the war often makes the task. Remarkably kind, Death gives the reader glimpses ahead at times, admittingly to soften some blows. For a book so laced with realism, this giant metaphor comes alive and places himself so perfectly alongside the other characters the reader forgets what is figurative and believes he is there. One of the better books I’ve read this year, The Book Thief is rich in characters, theme, symbolism and relevance. And on another note, while I didn’t need to add any books to my TBR pile, The Millions just published its list of the top books since the year 2000 if anyone is interested. There’s a long list, a short list of 20 and a reader’s list of the top 20. I'm so glad you liked this book! I thought it was outstanding – especially as it was billed as a young adult book. Funnily enough, I didn't realize it was a YA book until after I read it and looked at some reviews. It definitely holds much to think about and is well written. I agree with you that Death is the most compelling character. Yes – I can see YA (and would LOVE to teach this one! ), but it really is very appropriate for adults… first book in a while that actually made me cry. I loved, loved, loved the ending! Whenever someone asks me for a book recommendation, The Book Thief is always on my top five list. So far, not one person who I have recommended it to hasn't loved it completely. Interestingly, I read somewhere that The Book Thief is YA in the US, but not in other countries. Apparently, Liesel's age put this book into the YA category, even though it belongs on anyone's bookshelf, regardless of age.